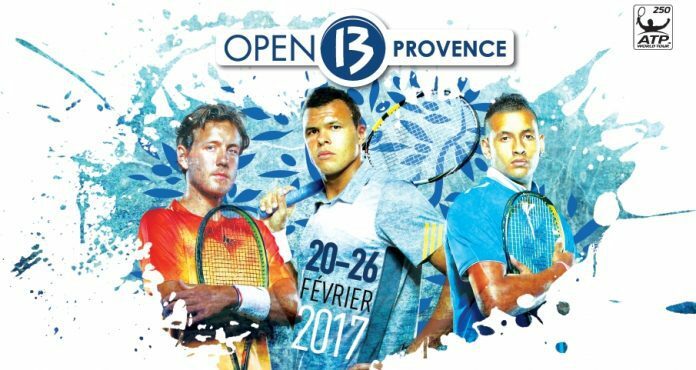 The second of five ATP Tour stops in France is the 250 in Marseille, where a host of Frenchmen, and a crop of talented young guns will take to the indoor hard courts looking to make their mark on a still young season. Despite being a 250, Marseille boasts the strongest and most intriguing field on the ATP Tour this week. Having lost four straight, Greek teen Tsitsipas could be suffering from a crisis of confidence in his still young career. That said, Youzhny doesn’t seem fit, and this is a tremendous opportunity for the Greek to get his first ever ATP win. Tsitispas is a solid young gun, he had his chances against Tsonga in Rotterdam but failed to take them due to a lack of aggression. Youzhny may still win this unless Tsitsipas plays with confidence. Medvedev has a quarterfinal and an ATP final already this year, Paire has reached two semis and almost scored a big win against Marin Cilic in Rotterdam. Medvedev when healthy is a threat to Paire, but in addition to playing at home, Paire should be fitter and in better form, giving him an edge. Twice a former champion, the 32 year old Simon badly needs to find some form in Marseille. Khachanov is a talented young gun but has struggled under the weight of expectations thus far in 2017, and is also looking to get back on track. Simon is likely to grind his way to a round 1 win. Playing at home, the veteran Benneteau is a clear favorite. Benneteau has flirted with returning to the ATP level after injuries, and has mostly played on the challenger tour. Shapovalov is still lacking in ATP experience, and became infamous after sending a chair umpire to the hospital due to an errant ball he hit in frustration during the Davis Cup. Shapovalov is talented, and it will be interesting to see where his head is against a crafty veteran in Benneteau. Gael Monfils has played just one tournament in 2017, and it’s hard to predict what form the French flyer will show up in. He should defeat a pedestrian Jiri Vesely or a qualifier in round 2 though, to setup a match with his countryman Richard Gasquet. Gasquet will look to stave off an upset bid by Robin Haase, then teach the young Tsitsipas a lesson, presuming the Greek defeats Youzhny. Monfils leads the h2h with Gasquet 7-5, but Gasquet won their last meeting. Gasquet has been playing more this season and reached the final in Montpellier, I have him finding continued success in France and defeating Monfils in the quarters. Lucas Pouille has been struggling mightily, and thus I have him falling to his experienced countryman Paul-Henri Mathieu in round 2, after PHM puts away Aljaz Bedene. Paire will face Jeremy Chardy (or J.L. Struff) in round 2 meanwhile, look for Paire over Mathieu in the quarterfinals to break a 1-1 h2h, as long as Paire is focused. I have a third all French quarterfinal in my bracket, as Rotterdam champion Jo-Wilfried Tsonga, twice a champion in Marseille, should ease past Illya Marchenko/Qualifier, while Gilles Simon should defeat Khachanov and Benneteau/Shapovalov to reach the quarterfinals. Tsonga leads Simon 8-3 in the h2h, and with the bye giving him some rest, Tsonga should make the semifinals this week. Defending champion Nick Kyrgios will serve it up against Andrey Kuznetsov or Malek Jaziri, with a matchup against fellow young gun Alexander Zverev looming in the quarterfinals. Kyrgios hasn’t played much in 2017, but neither Kuznetsov or more Jaziri are a threat to his serve. Zverev opens with home favorite Nicolas Mahut, with a qualifier to follow. The extra match should be enough to boost Zverev’s form enough to defeat Kyrgios and reach the semifinals. He’d love a second ATP title in France already in 2017. The pair have never met at the pro level before but are players full of promise. A four-time ATP champion, PHM reached a tour final as recently as last year. The veteran is a shell of the player he once was, but he’s still a solid enough ballstriker to make a run at least once or twice a year in a tour level event. His focus has always failed him in tight moments though, and he’ll need to defeat Pouille and Paire to reach the semifinals, two opponents with more weapons than he possesses. Gasquet leads Paire 4-0 in the h2h, Zverev just beat Tsonga in Montpellier and should be fresher. If these are the semis, it will be a complete repeat of 2017 Montpellier a couple of weeks ago. It would be a reprisal of the other French ATP final this year, Zverev won that one, and I don’t see any particular reason why he can’t win himself another title in this 250. Two ATP 250 tournaments, and a 500 on clay are on the calendar this week as the ATP World Tour careens towards the spring season. Seven top 20 players in Marseille, as this tournament has one of the strongest 250 fields of the year and is stocked full of talent from top to bottom. Paire is still ranked in the top 25, but he’s been struggling early on this season. The Frenchman has lost four straight matches to lower ranked opponents and must turn his game around quickly or his season could be heading south. Bolelli hasn’t played since the Australian Open, and it will be his forehand against Paire’s backhand. Paire is a slight favorite, but anything could happen. Andrey Kuznetsov is 6-3 to start the season, Pouille has an ATP quarterfinal on his own record, and home court advantage. Both are under the age of 25 and have promising futures ahead. Kuznetsov’s recent form makes him the favorite, though Pouille is a shotmaker in his own right. Stan Wawrinka headlines the Marseille field, he’s 7-1 to start the season, and has a relatively clear path to the semifinals. Wawrinka will face off with Feliciano Lopez or Sergiy Stakhovsky. Stakhovsky hasn’t won a match in 2016, while Lopez has also been disappointing this year. Wawrinka has a 4-2 h2h against Lopez and should advance into the quarters. Paire/Bolelli will face either Nicolas Mahut or a qualifier in round 2. Mahut had a busy week as a qualifier in Rotterdam, reaching the semifinals, and his serve and volley game suits him well indoors. Fatigue will likely doom him though, as I expect Wawrinka to beat him, or his best friend Paire in the quarters. Marin Cilic could have a difficult match against Joao Sousa in his first match. Sousa has to defeat Robin Haase first, and Cilic is just 5-4 to start the season, a poor record given his stature. Haase has lost four straight, Sousa has lost three straight, and thus Cilic is most likely to reach the quarters. Gael Monfils looms in the quarters, the Rotterdam finalist is 8-3 to start the year, and he’s been staying healthy and flying high. He opens with French wild card Quentin Halys, and then faces Pouille/Kuznetsov in round 2. Pouille and Monfils played a great Australian Open match last year, and either play could dispatch Monfils if he’s fatigued. Cilic vs. Monfils should be a great quarterfinal, Monfils has one h2h win over Cilic, but given the fatigue factor I have Cilic reaching the semis. Tomas Berdych will open with Alex Zverev or a qualifier in round 2. Berdych is 7-2 to start the season, while Zverev has a quarterfinal and a semifinal already. The young German has been on the rise this season and he has tremendous potential. Berdych has a h2h win though, and is most likely to reach the quarterfinals. David Goffin opens with young gun Hyeon Chung. Goffin is just 4-3 to start the season, but Chung is unlikely to rise to the level to defeat him, and his round 2 opponent will be Ramkumar Ramanathan, or a qualifier. Goffin can garner some momentum and reach the quarters, but Tomas Berdych will be a tough out at that stage. Berdych has a h2h win over Goffin. Richard Gasquet opens with 2014 champion Ernests Gulbis or a qualifier, Gasquet beat Gulbis en route to capturing the title in Montpellier, and home soil should suit him well once again. Gasquet vs. Gilles Simon is the most likely quarterfinal match. Simon, a two-time champion, who is just 1-2 in his last three matches, opens with Teymuraz Gabashvili, who has an ATP semifinal this season, with Nick Kyrgios or Vasek Pospisil to follow. Pospisil is 1-4 to start the season, while Kyrgios is always a bit of a wild card in terms of his performance and focus. Kyrgios has never played Simon, and his attacking tennis will clash with Simon’s pushing. Gasquet dominates the h2h against Simon (6-1), and has won his last three matches against Kyrgios as well, making him the semifinal favorite. Kyrgios has the ability to run the table and win this tournament, but his focus and effort has been questionable as of late. Pospisil and Simon are beatable early on, given their recent struggles, and he’d need to rise up against Gasquet to get to the semis. Wawrinka is 9-2 against Cilic, and he’s a clear favorite to reach the final. Gasquet leads the h2h against Berdych 7-6, and won the last meeting at the 2015 US Open. Berdych should have a slight edge though in terms of long term form, and thus I have him reaching the final. Wawrinka has won six straight meetings against Berdych, including their indoor final last year in Rotterdam. Presuming Stan finds his form, he should capture the Marseille title.